We’re lucky enough here in Roanoke to live close (well, 2 hours close) to Charlottesville, Virginia–home of UVA. Though it’s a smaller town than Roanoke, C’ville is definitely more bustling and food adventurous than here thanks to the university community. And, being a Georgia girl, the fact that it even has its own Mellow Mushroom makes me weep with envy. One day, Roanoke, one day. 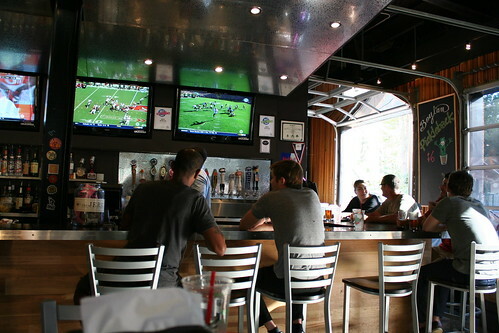 But there are way cooler restaurants than my old standby Mellow Mushroom! Take for instance a visit a few weeks ago to see the band Stars play. Not only was the show awesome (I’d been kicking myself over and over for not going in 2005 when they played in Atlanta), but our pre-show eats were superb. Even though I’ve eaten at quite a few restaurants in C’ville, there are always more to visit, and, with vegan dinner in mind, I felt a little adventurous. Afghan cuisine? Don’t mind if I do. 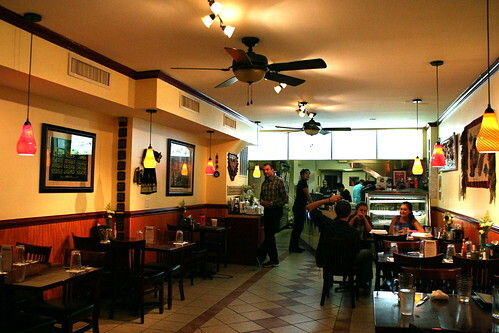 Ariana Grill Kabob House is located just outside of the university’s reach on Main Street. It’s a little hard to find, but directly across from the Hampton Inn, so that helps. When we arrived around 7, we were one of the only tables filled in the small, narrow room, but a steady flock of pick-ups and the phone constantly ringing for take-out erased any worries that the food wouldn’t be as good as the Yelp reviews. I’d researched Afghan cuisine a little before choosing the restaurant–while there were definitely vegetarian dishes on the menu, with little to no description, I had no idea whether they were vegan or covered in ghee or yogurt sauce. Turns out that Afghan cooking blogs (in English) are few and far between–I only found one, Afghan Culture Unveiled, and, through it and other recipes online, I felt pretty safe assuming that the vegetarian dishes would be vegan. If a yogurt sauce were to come with any, I knew I could ask for it on the side/not order it. Even better, after asking our server if any of the dishes I ordered had milk or butter in them, he told me that none of them did, except for the pumpkin dish which came with a yogurt sauce that didn’t need to be on it. Score! So, the food? I’m an Afghan food convert. (And I’ve pinned a bunch of recipes from Afghan Culture Unveiled too!) 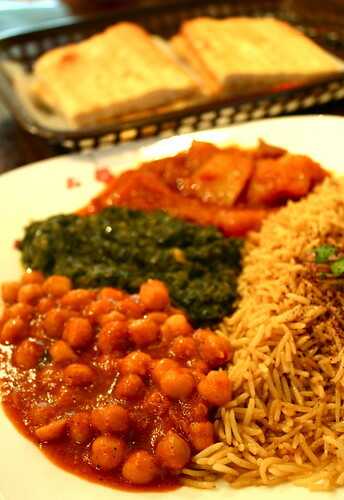 The basmati rice was simply prepared with a bit of oil mixed in and the various vegetarian dishes all held their unique merits. G’s favorite was the chickpea dish–mildly spiced with lots of cumin spiking the tomato base, it was a little reminiscent of Chana Masala, but much more subtle. The spinach dish, again, was like an Indian preparation, but with little peppery hints. My favorite, the pumpkin, was silky soft and almost sweet with turmeric and garlic livening up the dish. Served with a traditional Afghan flat bread, the meal was not only incredibly cheap, but more than I could eat and made for a great lunch the next day. Ariana is a fantastic find in Charlottesville and if you’re ever in the area and looking for something a little different, you should definitely seek it out! On the other side of the spectrum is Boylan Heights. I wrote about Boylan Heights last fall, actually, and, unsurprisingly, the restaurant is still incredible. This time, G & I stopped in for a late lunch when we drove back to Roanoke from Richmond. While G parked the car, I was able to catch the last 20 minutes or so of the Falcons-Panthers game which was terrifying nail biting (but the Falcons pulled through so that’s ok). Going with the vegan burger again, I piled it high with caramelized onions, sauteed mushrooms, vine ripened tomatoes, and their greens mix, with a slathering of BBQ sauce on the bottom. I dare you to find a better vegan burger ANYWHERE. The burger itself is nutty and slightly sweet, but overall a very savory blend of mushroom, carrots, pecans, and rice (among other ingredients), and I’d kill to be able to make something that good at home. I need to start trying, I guess. The burger itself is so big that it’s hard to put a dent in the awesome side of curly fries, but it’s worth grabbing a few nibbles of those as they really hit the spot. Oh, and you know what also hits the spot? 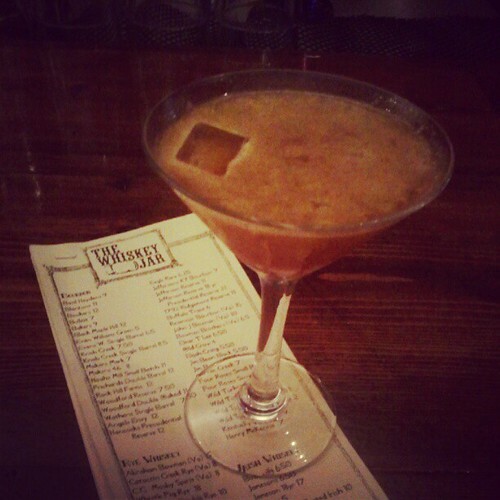 A cocktail from Whiskey Jar. My Old Fashioned was one of the best I’ve ever been served in the state of Virginia. I’ll forgive the fact that it (bafflingly enough) came in a martini glass because the deeply boozy nature of it put me in a great spot that night. Charlottesville is a great spot to find vegan eats and I can’t wait to head back to try out the other dishes at Ariana Grill (and the other drinks at the Whiskey Jar). It’s probably a good thing that none of those restaurants are close to me–I’d go broke for sure. Wow, that is definitely the most luscious-looking vegan burger I’ve ever seen. Makes my mouth water. As I’ve said before, your food photography is superb—when I look at your shots, I can almost smell the food. We’re only two hours from Charlottesville too and yet you seem to make it there much more frequently than me. I need to remedy that. I think the Afghan restaurant will be a big impetus because I haven’t had Afghan food since we lived in Baltimore (the pumpkin dish is my favorite too!). 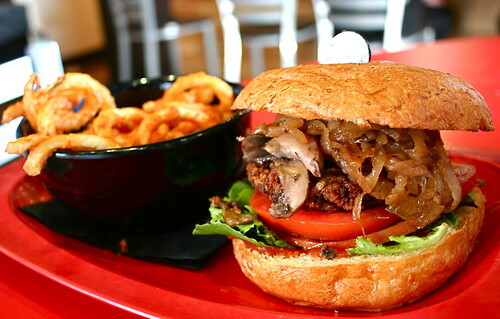 Also, that burger (minus the mushrooms, of course, but with those delectable onions) looks amazing. C-ville here I come! I’ve never had Afghani food! So that’s obviously going have need to happen sometime soon. Charlottesville sounds like an amazing place to eat vegan in the south! Ohhhhh! I went on student exchange to UVA for the 2007-8, so this post tugs at my heart! I remember loving a place called (I think?) Essie’s which had this incredible salad with fresh dates and goat cheese, and the cornbread they served with it… phwoar. Lucky vegans living in Cville have some amazing options! Love the photos, Jes. What yummy looking food! The only Afghani food I’ve tried so far is bolani, and I love that. Nicest looking burger I’ve seen in a long time. Oh, thanks for this post! I will be sharing it with a friend who lives in Charlottesville (she’s a Ph.D. student).